1. Several blogs have given space to a scurrilous statement that I, my wife and my children, have USD 199.45 million and S $ 42,000,000 in fixed deposit in the Israeli National Bank in Singapore. 2. The scum who alleges this does not have the guts to give his name. 3. UMNO can make a statement about the money I gave to Dato Abdullah when I stepped down. Better still Dato Abdullah can explain how much of the 1.4 billion Ringgit in cash, shares and property that my staff and one of his Ministers handed over to him is still with him. 4. I give full permission for the Israeli National Bank to make public these accounts so that I can claim the money said to belong to me and my family. 5. As for the anonymous scum, give your true name, I/C and address so that I can sue you. I had checked the link given and it’s genuine. Dr Mahathir did post such a reply to his accuser at 11.20 pm on Friday, June 13, 2008. I think it was a good way to answer such an allegation. It was straight to the point and using plain language. 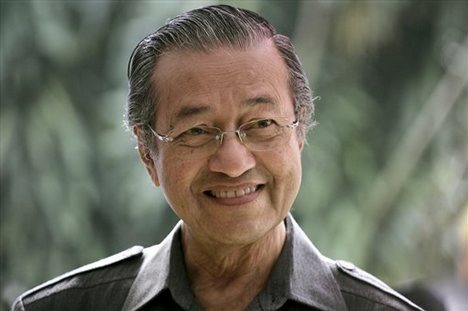 Dr Mahathir knew he was not guilty and didn’t hesitate to say that he dare to sue his accusers. No need to even consult his lawyers on whether to sue or not. And in Najib’s case he doesn’t even have to ask for the scums who accused him of being a thief for their true name, I/C and address so that he can sue them. They are all out there in the open.